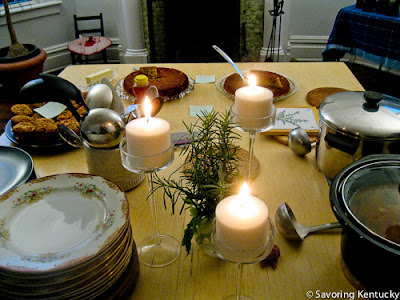 Early arrivals added to a tranquil winter table. 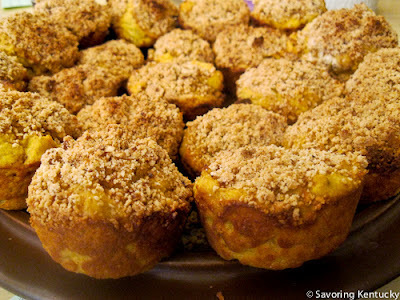 Experimenting with pumpkin, peanuts, and cornmeal led to Pumpkin Cornmeal Muffins (not very sweet) with Peanut Streusel (plenty sweet), all gluten-free. 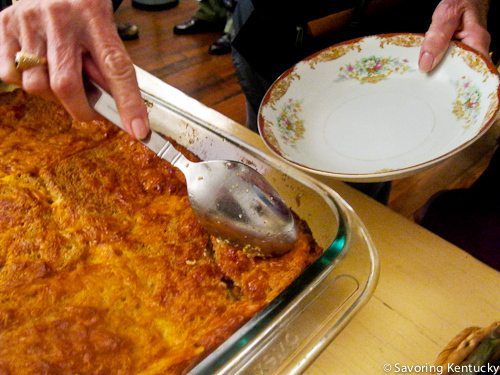 This dish excited the young child whose grandmother prepared and brought it. I love that, the way the children at Cornbread Supper love and anticipate their own family's food, and wait eagerly for adults to start serving it to them. The children of Cornbread Supper add more than they can imagine - including their own food labels, at times. Savory Pumpkin Cornbread \ Contains bell peppers, onions, eggs, dairy. Gluten Free. No nuts.